ABIDJAN, May 23 (Xinhua) -- China and Cote d'Ivoire have pledged to deepen cooperation within the framework of the Belt and Road Initiative and the Forum on China-Africa Cooperation. 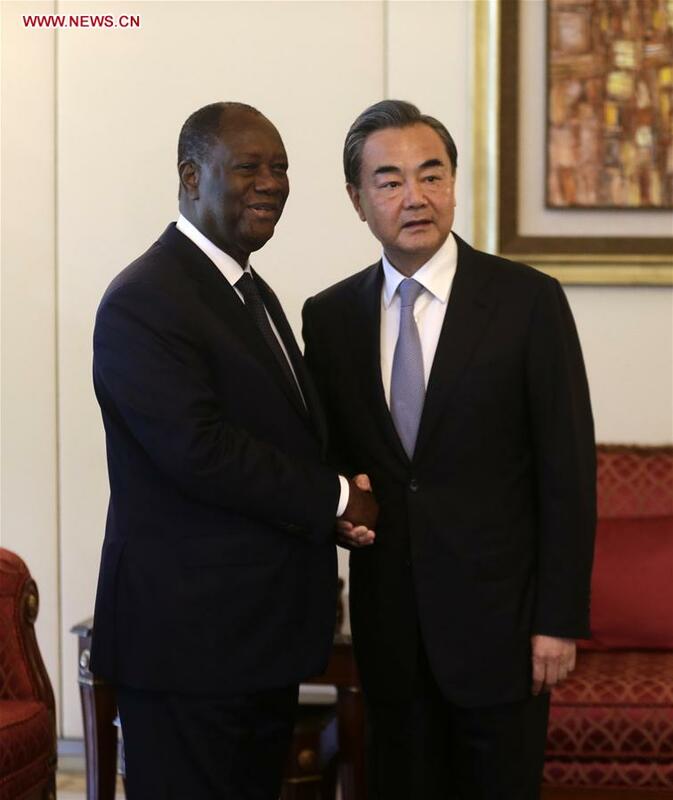 In a meeting with Chinese Foreign Minister Wang Yi, Cote d'Ivoire President Alassane Ouattara commended the China-proposed initiative and expressed the country's willingness to join it. Proposed by China in 2013, the Belt and Road Initiative, which comprises the Silk Road Economic Belt and the 21st Century Maritime Silk Road, aims to build a trade and infrastructure network connecting Asia with Europe and Africa on and beyond the ancient Silk Road routes. Ouattara said the initiative is beneficial to many developing countries and small and medium-sized nations. Deepening cooperation and long-lasting relationship between Cote d'Ivoire and China sets a good example of Africa-China friendship, said Ouattara, adding that Cote d'Ivoire is proud to have a reliable partner like China. Cote d'Ivoire regards China as a stabilizer and catalyst for the peace and development cause of mankind and would like to maintain communication and coordination with China on issues such as the reform of the United Nations (U.N.) Security Council, said Ouattara. For his part, Wang said China is a sincere and reliable partner to Cote d'Ivoire and cooperation between the two countries has gained momentum in recent years. China has become Cote d'Ivoire's biggest financing source and third largest trade partner, Wang said, adding that the two countries enjoy broad prospects for win-win cooperation. China is willing to contribute to Cote d'Ivoire's industrialization drive and help the country enhance its ability to develop on its own and wean itself from dependence on export of commodities as a major development mode, said Wang. Wang said China welcomes Cote d'Ivoire and other African countries to join the Belt and Road Initiative and believes that it will inject new impetus into China-Africa cooperation. "China commends Cote d'Ivoire's efforts in integrating west Africa and supports Cote d'Ivoire in playing a more important role on the international stage," said Wang, adding that China will work with Cote d'Ivoire to defend the legitimate rights of developing countries. In another meeting on Monday with Ally Coulibaly, minister of African integration and Ivorians abroad of Cote d'Ivoire, Wang said the two countries have maintained sincere friendship, treated each other as equals and supported each other on issues regarding core interests and major concerns over the years. Coulibaly said Cote d'Ivoire is dedicated to cementing bilateral ties and will deepen cooperation with China in areas of economy, trade and finance among others. Cote d'Ivoire appreciates and supports China's Five Principles of Peaceful Coexistence and hopes to improve global governance and establish a more just and rational world order on the basis of the principles, said Coulibaly. Cote d'Ivoire is also willing to strengthen coordination with China on issues such as reform of the U.N. Security Council and climate change to jointly safeguard the interests of African countries and developing countries, he added.